With spring in full swing, there’s no better time to get out and explore the city. While Seoul has its fair share of reliable hotspots, there’s an undeniable charm in discovering something new. Enter Geumho-dong, a small up and coming burb between Oksu and Yaksu stations. Lit by lanterns spilling out from the local temple, its narrow streets are an eclectic mix of both the traditional and the new. Throw in the recently installed Darak Oksu gardens framing the paths beneath the railway tracks, and you have yourself a suburb with a decidedly different urban flair. Be it a date, or an intimate night out with friends, the following are a series of certifiable selections for squeezing the most out of your Geumho experience. Any respectable evening out always begins with a beer. Located mere meters from Exit 1 of Oksu Station, Chuck’s Tap House is your one-stop destination for those seeking some fancy brews. 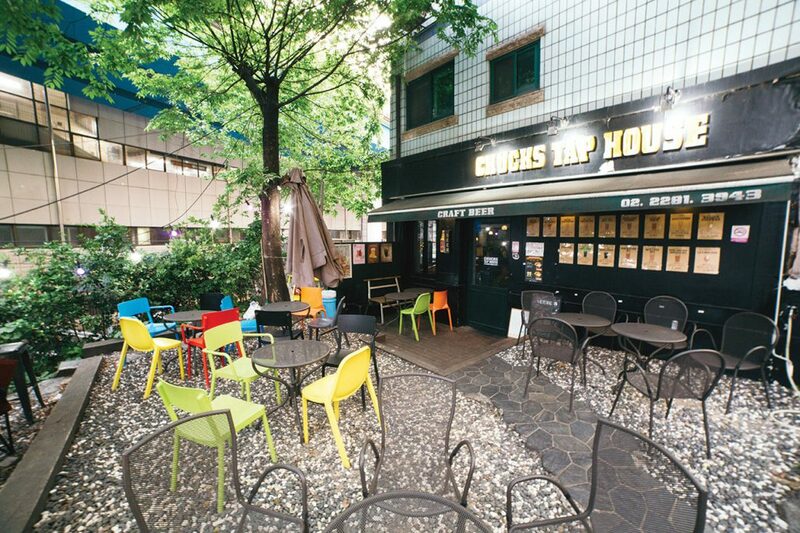 There are a total of twenty craft beers on tap to choose from, nine of which come straight from the Whasoo Brewery in Ulsan. Should you find yourself feeling overwhelmed with all the options, the Yuzu Pale Ale is a safe bet for any palate. Chuck’s outdoor seating provides the perfect place to take a load off, knock back a few well-crafted cold ones and enjoy some company in the warmth of the setting sun. Finger food such as chicken and fried samgyeopsal are available, but for now, keep it low key if you can. The food at our next stop is absolutely worth the wait. 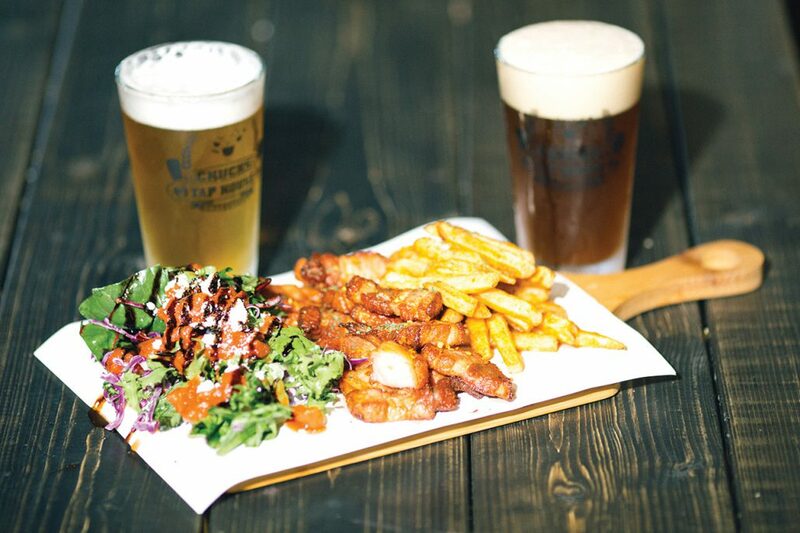 By now you should be buzzing from the craft beers downed at Chuck’s, but all that socialising you’ve been doing has likely left you with an appetite. Thankfully, there’s a stellar fine wine and dining restaurant just a short, ten-minute walk away. Prepare thy tastebuds for the criminally underrated Mokhwa Dabang. Mokhwa Dabang is a small, stylish venue that bears a distinctively retro vibe. The checkerboard flooring, green leather seats and ambient track lighting instil a homey, yet upper class atmosphere. High quality service by the waitstaff ensures that your every need is taken care of from the moment you walk through the door. A private, curtained off table is also available for those that might be after a more intimate affair. 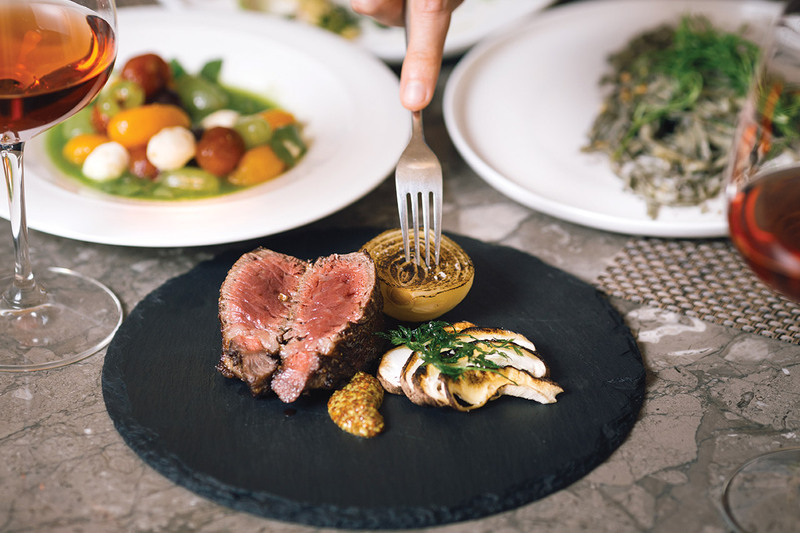 Head chef and manager Um Sun-young will make sure anything ordered is special, but if you feel like spoiling yourself look no further than the Hanwoo steak. These perfectly seasoned and tender cuts come with a side of shitake mushrooms and a spicy whole grain mustard. For those who fancy their red meat, this is an elegantly prepared dish that you’ll be reminiscing about until your next visit. To watch the magic unfold, you can even watch Um at work from the bar that surrounds his open kitchen. 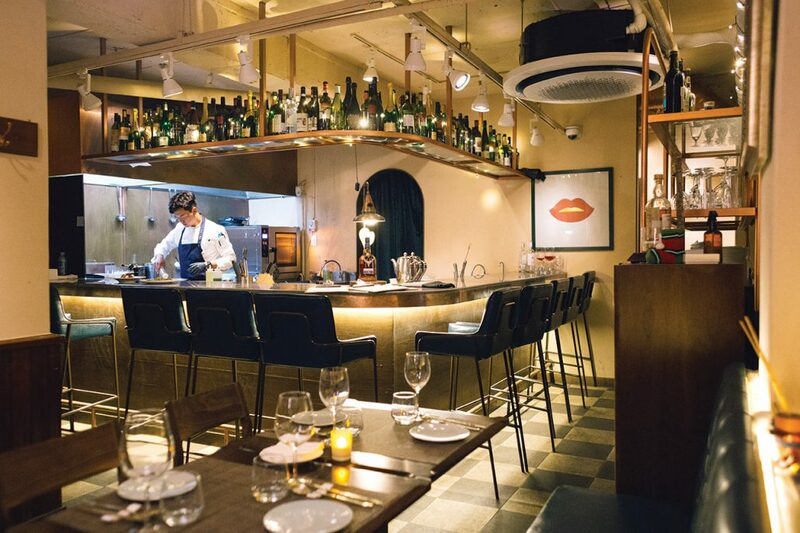 An extensive wine and cocktail menu has been constructed to compliment the food should you wish to keep the booze flowing freely. With bellies full of food, craft beer, and fine wine, you might be tempted to call it a night and start making your way back home. But let’s not be hasty! The warmer weather provides one of the area’s best options for capping off your evening — a relaxing riverside stroll. It also doesn’t hurt to get a little light exercise in after putting away all that steak. Entry down to the river can be found by Exit 3 of Oksu station. Bicycles can be rented on the cheap, with designated paths for both pedestrians and cyclists alike. 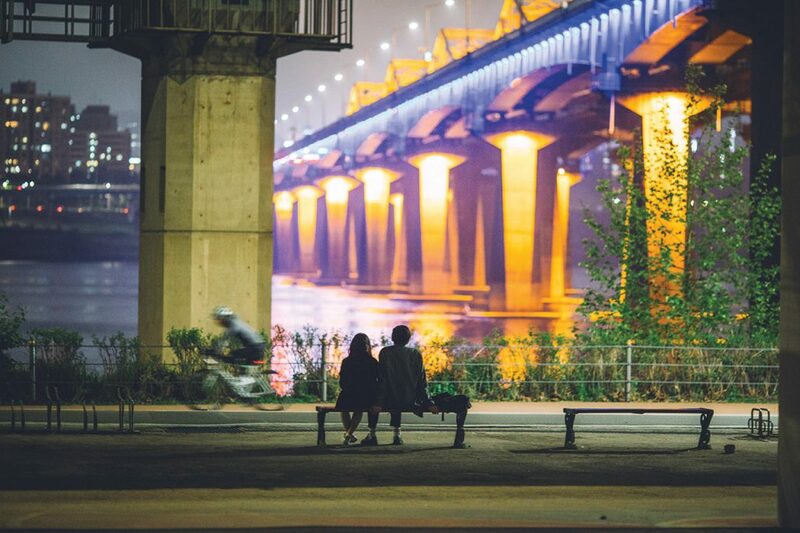 The neon lights of the Dongho Bridge shimmer and sparkle across the Hangang, providing the perfect backdrop for a romantic stroll, or perhaps just a pleasant ambience for snuggling up on a park bench and gazing out across the water.